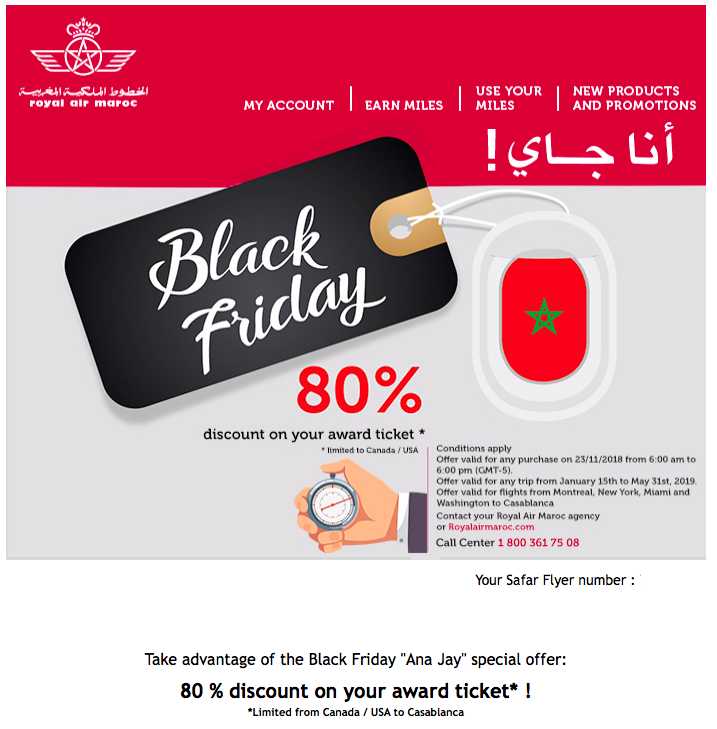 Royal Air Maroc Black Friday Redemption Special – 80% off award tickets from North America to Casablanca! Wow! Earlier this week we brought you RAM’s really good offer of 50% off award tickets on their entire network but for those of us in North America here is an even better offer for booking tomorrow only! You can redeem your Safar Flyer miles at an 80% discount for RAM’s flights from Montreal, New York, Miami or Washington to Casablanca! That’s right 80% off! – Discount applicable on the amount in miles. – Offer valid for one way or round trip from Montreal to Casablanca or from New York / Miami / Washington to Casablanca, valid on Economy and Business Class, subject to availability. – Offer valid for any trip from January 15th to May 31st, 2019. – Airport taxes for award tickets are payable. – Travel dates for the award ticket can be change once for free (travel dates above), non-refundable ticket. – The first award ticket request must be exclusively attributed to the Safar Flyer account holder. For Safar Family accounts, the first award ticket request must be attributed to one of the Family account members. – Family account holders must enter the number of their family account to book an award ticket. – Offer valid on royalairmaroc.com (option “Buy a ticket with my miles”) or in Royal Air Maroc agency.